Transformers kitbashes (what you or I would call a custom) are nothing new. Fans have been repainting TFs almost since the beginning, and our friends over at Reprolabels have been around for years. It's only recently, however, that high-quality accessories and add-ons have started to appear, thanks to folks like the Fansproject. Yeah, I don't know what any of that means, but at least it's all spelt right and grammatically correct. Not even official releases can usually manage that, so already we're seeing care taken in the production. Fansproject first came on the scene with a kit to make the Classics Cliffjumper more distinct from Bumblebee. They next did a suit of armor for Ultra Magnus, and now the "TFX-ABT-01" ABT OP Upgrade kit. The smallest set they've yet done, "TFX-ABT-01" ABT OP Upgrade kit (yes, that's its full name) is an add-on for the Alternators/Binaltech Optimus Prime. Thus the "ABT OP" bit. Dissatisfied with the dinky little gun included with the Alternators Prime (or BT-22 Convoy, if you prefer), Fansproject set out to make an appropriate representation of his classic ion rifle. As a gun, the piece really does look fairly accurate. We get the long barrel and the bulky power pack (or whatever it is) in the back, and the handle has small pegs to plug into Prime's hands. It's 4" long, and despite having some kibble and obvious transformation points, the look is right and the mode is solid - the gun isn't flopping all over the place. Yes, it's gray instead of black, but Masterpiece Prime did the same thing, and nobody seemed to mind. 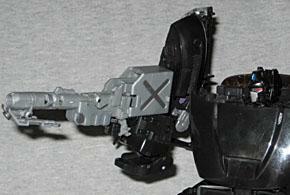 Since the point of Alternators was truly "robots in disguise," just molding a new gun for Prime would have been a half-assed solution. Fansproject actually put some work into this piece, making it something that would work in both modes: most of the Alternators had their weapon formed from the car's engine, but that was already taken. So instead, the rifle folds up to become a portable gas can and... some other container. I don't know what. Something you'd be likely to see in the back of a truck, that's for sure. They look nice, and can even clip in place on the rail, so you don't lose them and they don't rattle around as Prime drives. You're ready for outdoor adventure! Apparently deciding a gas can/gun wasn't enough of an offering, Fansproject also made a small vac-metalized Matrix of Leadership and a chest compartment to store it on. 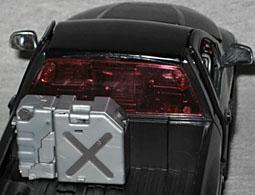 The Matrix plugs into the storage piece, and the piece snaps in front of the engine. It's secure in both modes, and doesn't seriously impede the transformation process. The Matrix stays snug in its place, and can be accessed easily whether Prime is a robot or a truck. The construction on the "TFX-ABT-01" ABT OP Upgrade kit is very good - you may even forget this is an unofficial, fan-made product. The plastic quality feels the same as any other TF accessory, and the joints are all tight. If you bought an Optimus Prime secondhand and it included this Upgrade kit, you'd never know it wasn't an original piece. And yes, it works with any of the Dodge Ram molds: Alternator, Binaltech, KissPlayers... anything and everything, since they're all functionally identical. Heck, maybe you used the base for a custom - it'll even work for that. For instance, I only have Nemesis Prime - as you can tell from the pictures in this review - and the set looks great on him (I pretend he's carrying a copy of his namesake's Dead Matrix). If you want to give your Binaltech Prime a bit more firepower and a little bit of juice under the hood, the "TFX-ABT-01" ABT OP Upgrade kit won't disappoint. This entry was posted in blog exclusive review, Fansproject and tagged Transformers. Bookmark the permalink.